So, next up after Bismarck is Wisconsin. 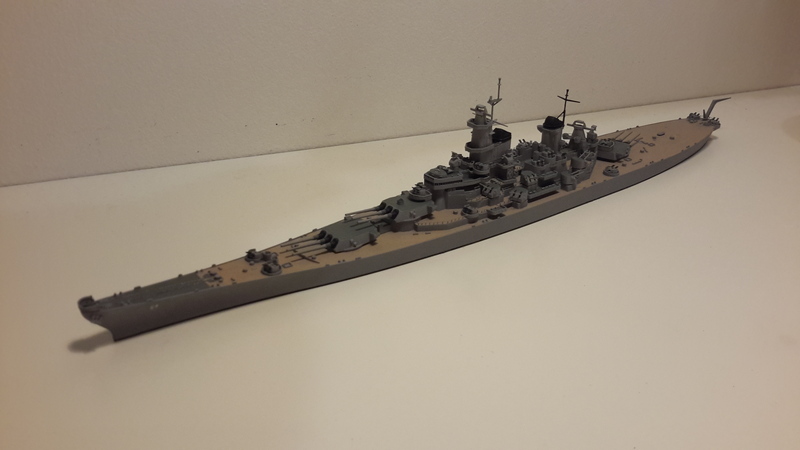 To start, i will be using Tamiya Missouri as base, since there seem to be no Wisconsin kit except Trumpeter and thats in later fit and I figured that Mo would be closer to Wisky than other two. Now, as far as I know the 20mm oerlikons were gone by 52, along with catapults and the shields for oerlikons on weatherdeck, correct? The radar on foremast also seems different. Rest seems to fit for the timeframe im going for, which is march of 52. Furthermore, which gray should i use to get correct haze gray? Using Tamiya paints. And as usual, there will be base included in the build. Progress so far, gotta cut off the excess bits. 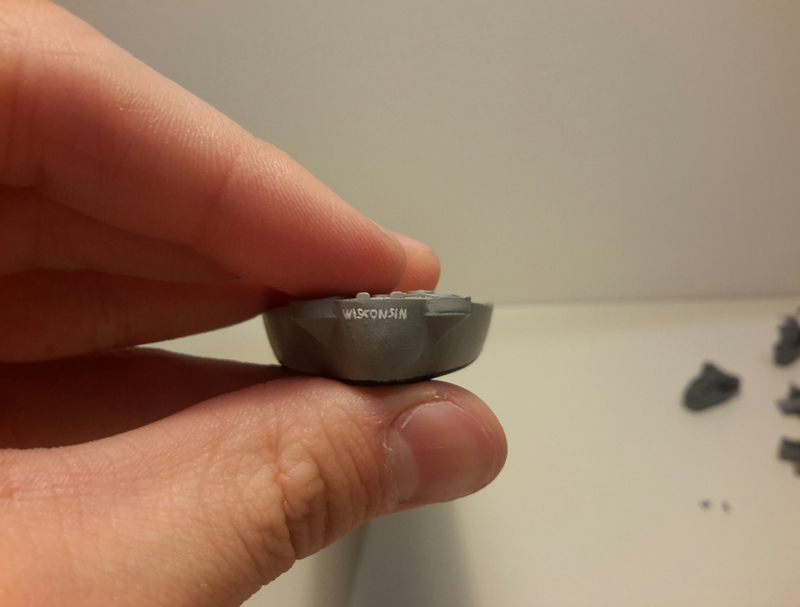 Testor makes a Haze Grey color. Tamiya also has hae gray, as spraycan. I prefer to use tamiya acrylics due to them being available at local hobby shop. Well, i guess i already had first accident. Cut into my finger when removing catatpult bases, with a fresh blade. Well at least it is a nice clean cut. That made me chuckle, it's healing better than expected so I felt confident enough to continue. 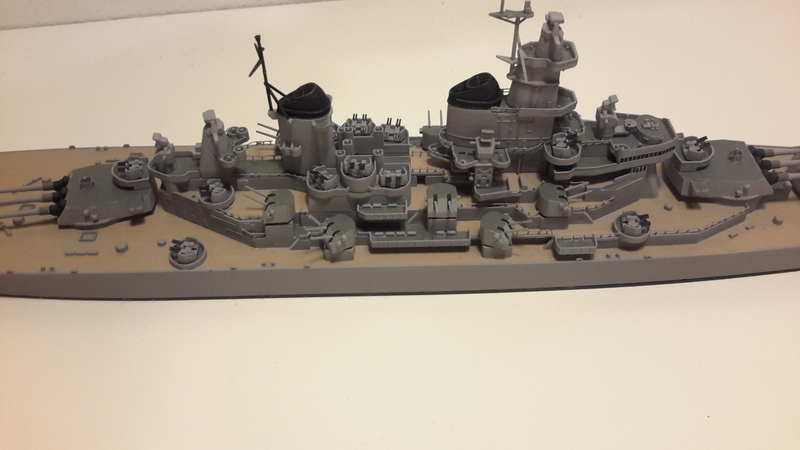 Cut out and cleaned diffirent bits of superstructure, removed excess on deck and built main battery with some additional detail. The mounting holes will be filled during weekend, aswell as scribing some planking lines. Still wondering about paint, have some Xf-19 sky gray left over, how should I modify it to fit? Karl: I don't want to rain on your parade here, but Wisconsin still had 16 20mm mounts aboard as late as October 1951. Don't know where they were mounted, but that tells me there is a possibility some were still aboard when she made her Korea tour in 52. She reached Yokosuka in November 51 before going to Korea, and that is the only place she visited, that I can see where those 20mm's could have been removed. 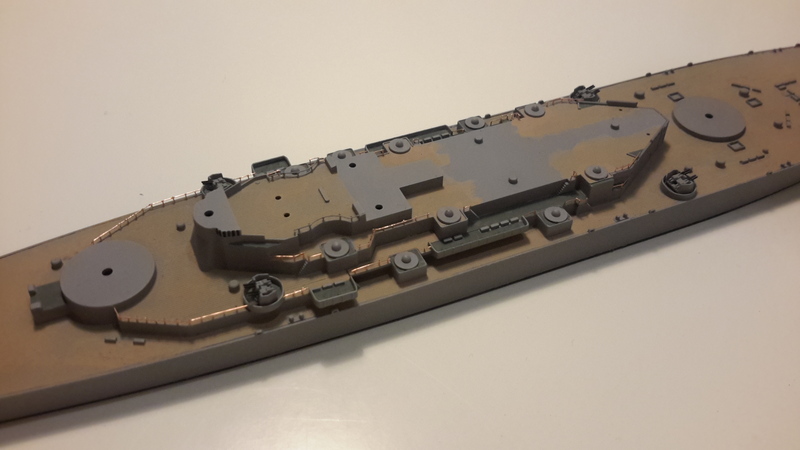 All good, I've only removed the shields on weatherdeck as those were gone by then, among with oerlikons. If there were any it is highly probably they were somewhere on superstructure, i will look into that. 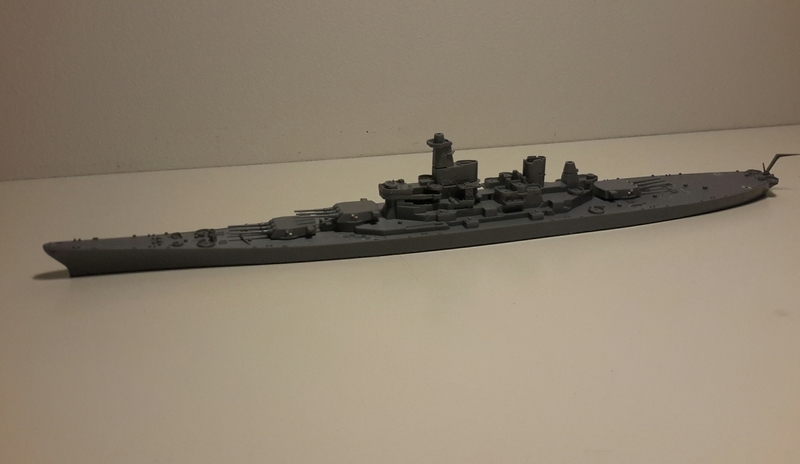 For now, Ive decided not to mount any oerlikons. 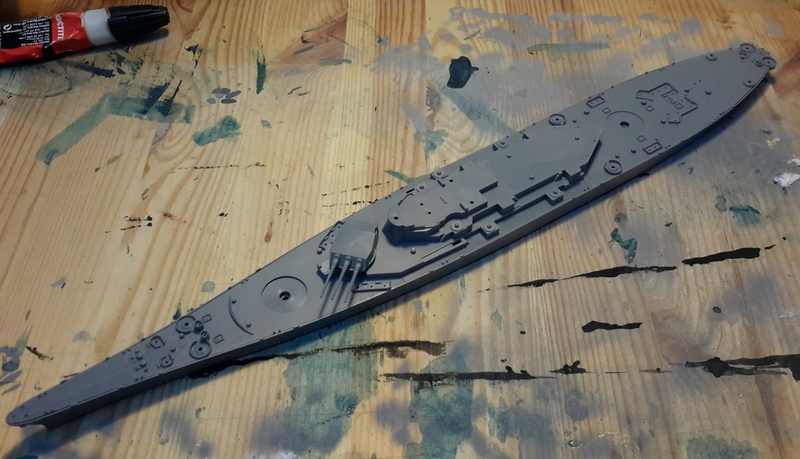 Managed to paint most of the ship, few touch ups to do. Now, i might need some decals, especially for the stern name. Any ides for that? Looked around a bit but found none. The removed bits, not really visible, which is good. If you have a jet-ink printer you could make your own using blank decal sheet. I thought of that but unfortunately it is not an option. I could turn Missouri into Wisconsin if i had two "N"s and a "C". But for now im kinda stuck, couldnt find any aftermarket either. 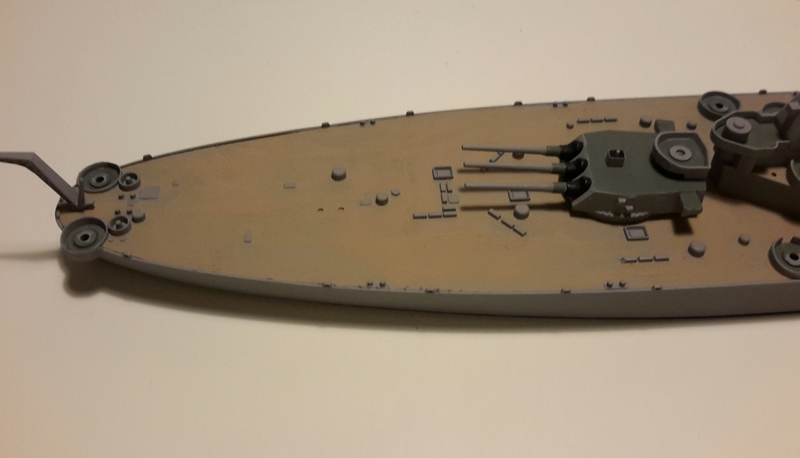 Due to being impatient, as I kinda happen to be, I just painted the name and hull number. Also continued with tradition of scratchbuilding railings. Bofors' have also been added. The hand painted name and numbers look pretty good. Coming together very well. Works for me, nice progress. 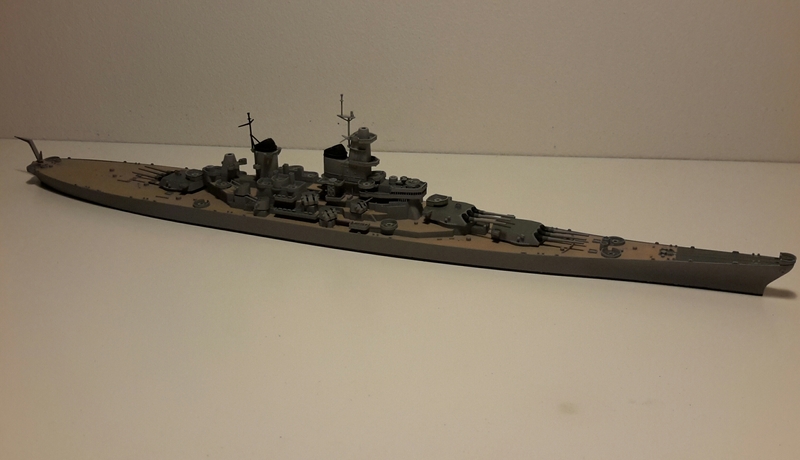 Karl: It may seem like I am trying to mirror your building sequence, as I too have a Bismarck nearing completion and a Missouri as next in line. Both are Meng kits and as you probably know are supposed to be snap together. They are a little more than the snap together would make you think though, and I bought them along with Lexington and Rodney for the specific purpose of testing my new sets of AK Interactive paint sets. As I related before on another thread I am very pleased with the DKM set but find the USN Set 1, not so hot. The blues all seem to be off by quite a bit to my eye. The grays are spot on though. All that said I intend to now do Missouri in a similar time frame, Korea, to your Wisconsin. Might I ask what reference you used for the white WISCONSIN on the stern. 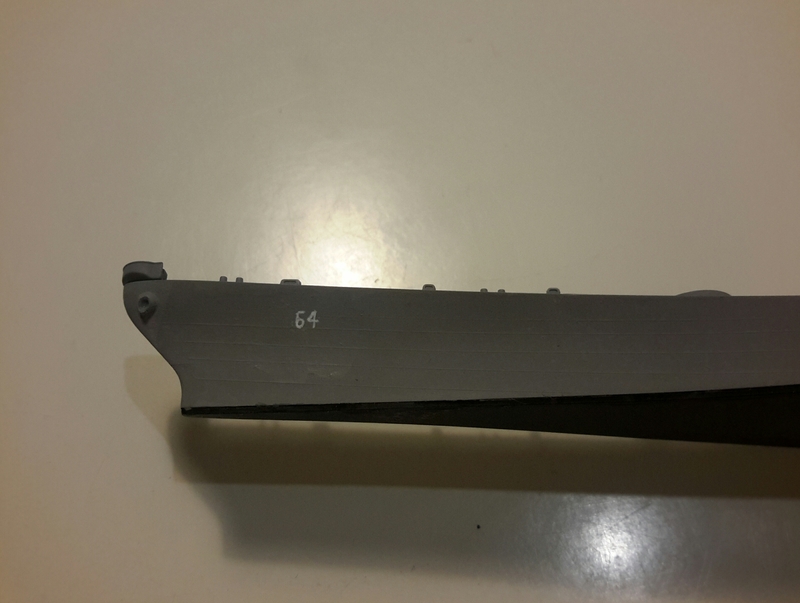 US ships normally have the name letters welded on the stern and are raised, but not so much that a painted on name or decal on the model would not fulfill the purpose. In war time these welded on names are painted over in the same color as that portion of the hull they are attached to. In peace time, all that I have ever seen, in person, including that of Iowa, Wisconsin, and New Jersey were all black, but that was in a much later period than Korea. I have looked for either white or black lettering during the Korea period without success. So in truth I am not at all sure what color they were in 50-53. The small bow and stern white un-shaded numbers are completely accurate for the Korea period though, at least until 1953. Had I known you needed a small un-shaded 64 I have them in 1/700 sitting in a drawer somewhere. If you need them they are yours for the asking. Still following your build closely. First off, I have to admit, there are no stern numbers, I haven't painted those since pictures of stern seem to be rather hard to come by. The name is based on two pictures of her in floating drydock, though it may have been repainted after returning from Korea. I may aswell paint over the name then, not entirely happy with it anyway. Now, what a coincidence, even moreso with my build being based on Missouri. Well, thank you for the offer of decals, but I find hard to find point in sending tiny decals to other side of the world, paint will have suffice. Well they are here and your's if you change your mind. The name thing is just one of those I don't knows. Perhaps you can get a Wisconsin locally from some one who built the Trumpeter kit and did not use them. Generally speaking all US warships post 1942 had bow and stern numbers. During the war they were quite small and about of equal sise on both bow and stern (actually both sides of the stern, for instance near where the prop guards are located on a US DD. After the war the practice was continued but with the introduction of shaded numbers the ones on the bow were larger, while the ones on the stern remained about the same size but were shaded like on the bow. Good luck, and please post anything you run across that may be applicable to my Korea conversion of Mo. You might try some model railroad shops. I suspect that N gauge would be close to the size you need.